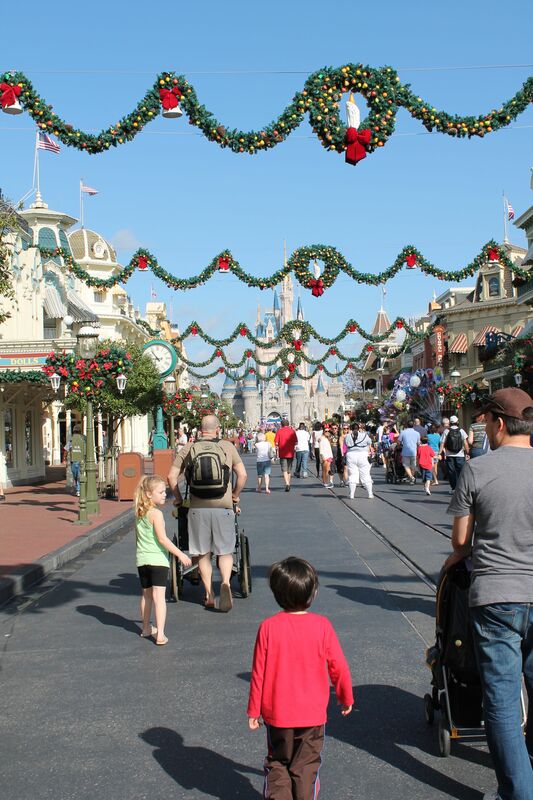 We are HERE at Magic Kingdom theme park at Walt Disney World where it truly is MAGICAL! It’s well worth being an early riser to catch the opening show! Just before we went through the gates into Magic Kingdom we stopped in at Guest Services and rented a wheelchair for the day. 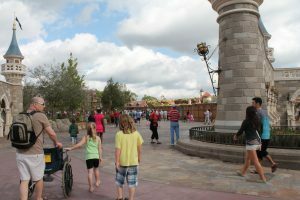 Our CAA Magical Planner made this easy for us by providing us with a specialized map identifying the rental location and the entrances at each ride for people with wheelchairs. It costs $12 a day and I certainly couldn’t spend time here without it. 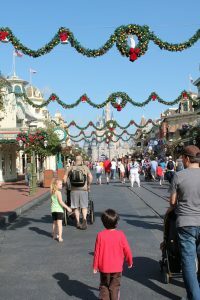 Making our way down Main Street USA we could feel the palpable energy of excitement. Our senses were alive with sounds of happy people, smells of delicious foods and the colours of the characters, balloons and sights to see. 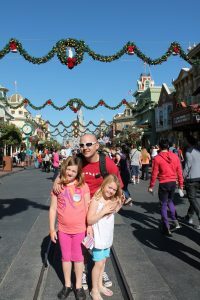 Knowing it would be a SUPER busy time of year our CAA Magical Planner took time to plan our route for us to ensure we got to enjoy the attractions we listed. For any little girl or boy this makeover is a dream come true! 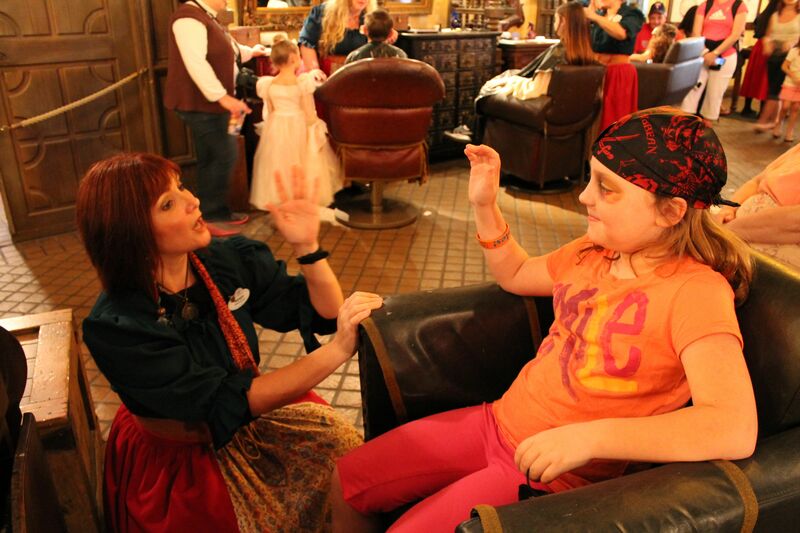 Our newly 7 year old daughter was in awe as we entered the castle and found the salon. We were treated like royalty as we checked in, Chelsea was given special attention with curtseys and the title “Princess” being used often. 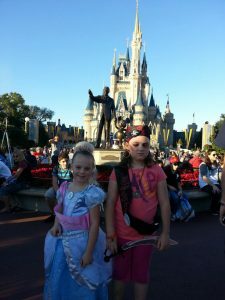 We chose the Coach Package which includes choice of hairstyling, shimmering makeup, princess sash, face gem and princess cinch bag—$54.95 plus tax. Chelsea had 3 choices of hairstyles to choose from and she went with the Fairytale Princess to no surprise. The salon itself is just adorable, fully kitted out in typical magical style! 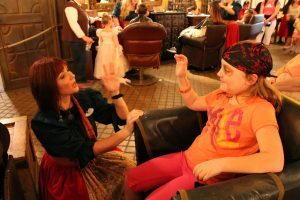 There was NO way Sydney was going to have a Princess makeover but when she heard she could get a Pirate makeover we couldn’t hold her back. At The Pirates League Sydney got to select her pirate style (I may have tried to encourage a bit of pink). The she went ahead and got her makeover which I give her credit for…she was patient. Next came the League’s training, this is given by some very seasoned pirates. Once this was done Sydney became someone else, she got her new name and insisted we refer to her as this the entire day! Our new Sydney has learned some swashbuckling moves, taken the official Pirate League Oath and walked in the pirate parade! Parade times are worthy of paying attention to, we followed our plan and made it to the spot where people in wheelchairs have a viewing area in time for the action. The characters really did come alive as they dazzled us all, singing and dancing down the street. Space Mountain is a classic ride in Tomorrow Land that my husband loves! He and the girls had a blast as they boarded one of 2 rocket-shaped, 3-seater vehicles and shot off to space and sped around the universe. 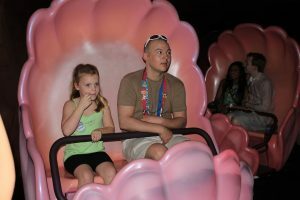 Once they got off the ride they went onto a moving runway that took them past scenes of life in the future and got to see themselves on TV monitors as they went. It’s common to see Chip & Dale right outside of this ride. 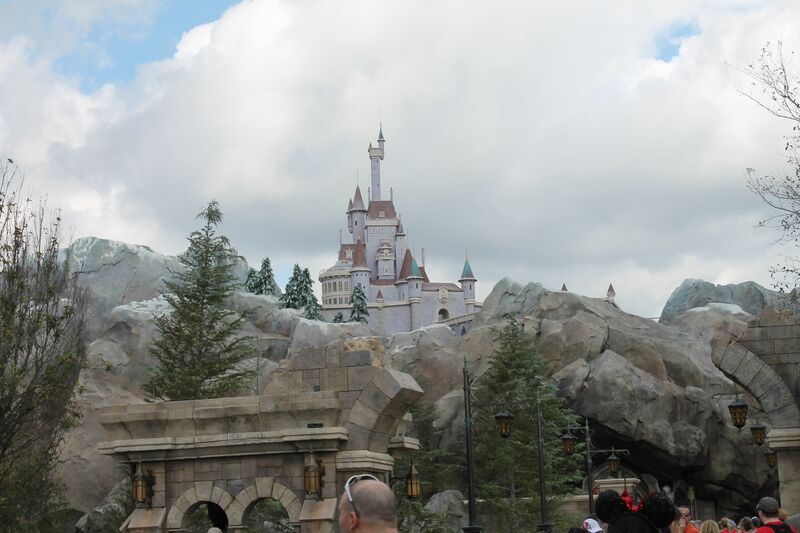 We’ve been very excited to see Fantasy Land….and we weren’t disappointed! Specifically we loved Under The Sea – Journey of the Little Mermaid. 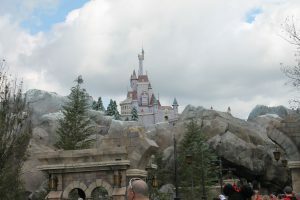 Beast’s castle looms above Fantasyland, where you’re immersed in the stories. We couldn’t secure a seating at Be Our Guest Restaurant, apparently this is booked for almost all of 2013 but we did enjoy the rest of this new expansion. 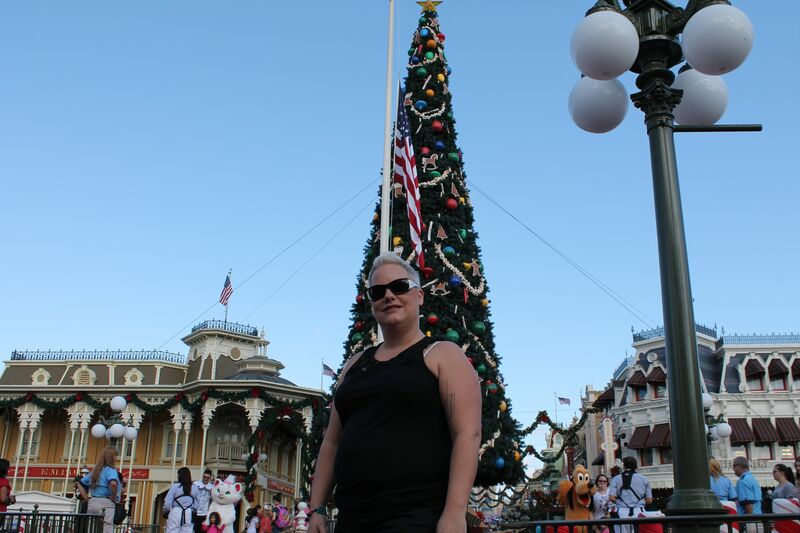 I am a serious lover of all things scary and the Haunted Mansion had me at Hello! We walked into the ride through a graveyard where tombstones howled at us and crypts played music as the instruments chiseled on them were touched. The super creepy ride attendants herded bunches of us into a room “the portrait chamber” where the walls slid shut behind us and there was NO way out!! As an eerie voice generously pointed out there were no windows or doors but if we looked up we saw someone hanging above us…..it was creepy as all get out! I won’t say much more because I want it to be a surprise but if you dig being scared, this is a fab choice for you. Of course we had to hit Pirates of The Caribbean, how could we not when Sydney cut such a dashing figure in her Pirate gear? 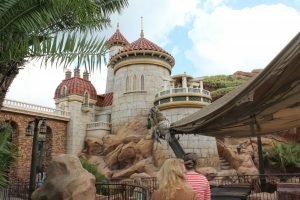 This ride has you on a boat that takes you up and down waterfalls, through a town where Jack Sparrow is hiding and the kids love looking for him. This is one for pirate lovers, they’re sure to fall in love with the life of a pirate! 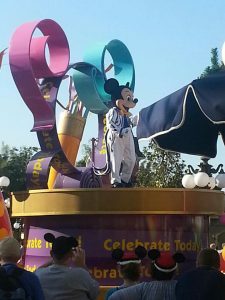 We are really enjoying ourselves, watch here for more info on attractions and the shows we see! 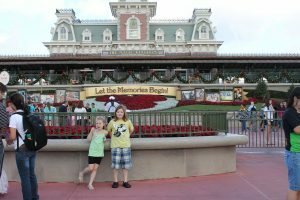 I’m pinning the post for the day when we take our kids to Disney, I want to wait until they are a bit older like your girls! looks like so much fun! Wow there is so much stuff to do and it looks like it was a blast! I can’t wait until my kids are a little older. I know they would love to be pirates! What a wonderful post! 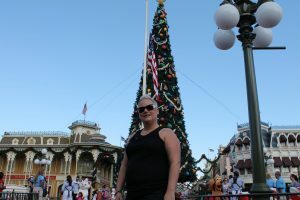 Your pictures reminded me of all my favorite parts of the Magic Kingdom when I went there. Can’t wait to take my boys when they are a little older! You touched on almost all of my favorites! 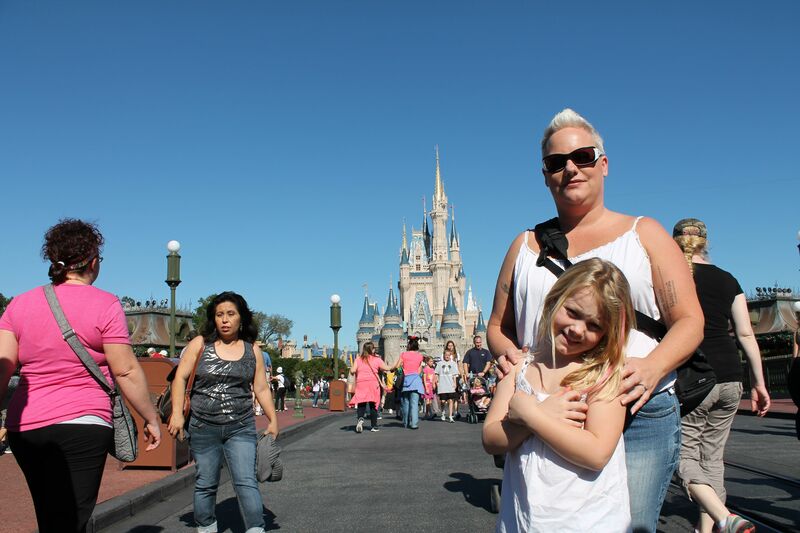 It looks like your family had an amazing time at Disney! Ahhh…I’ve never been to the Magic Kingdom but I can’t wait to go and take my kids! Such fun! Glad you had such a great time with your family. I’d love to visit with my children one day. 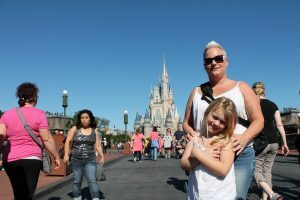 I’m dying to take my children to Disney! I’m hoping 2013 is the year! Although my children are a little young to enjoy the makeovers, you have provided a list of MUST SEE things that I never knew existed! I will also have to look into the CAA planner to help me create a magical trip! Jenn the CAA planners really know what they’re doing. Without them we couldn’t have done so much! Wow Julie! This looks like so much fun! I want to take my kiddies one day. I never even knew some of these things we available there and now I want to go even MORE! Time to beg the hubby… or bribe… beg or bribe… I’ll go with bribe first. Thanks lady! We hit up WDW when I was about 11 years old. Loved it!! (Though not quite as much as more thrill ride-centric parks like Cedar Point. I’m a coaster junkie after all. ;) Looks like a lot has changed / been added, but good to see a lot of the classics remain(e.g. Space Mountain & Pirates of the Caribbean). 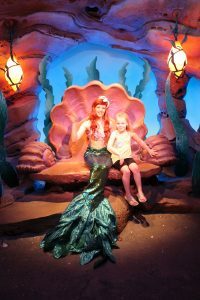 Your description and pictures do justice, it is such a blast for kids. I’ve been here many years ago as a little one and recently returned with the next generation.. it’s a blessing that mobility aids are so accessible here!